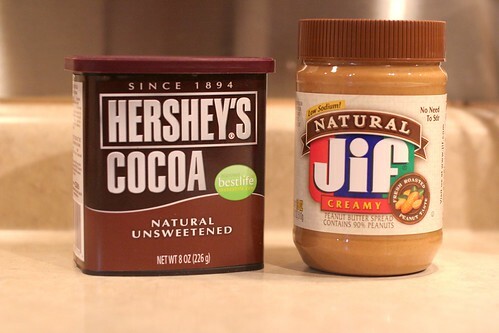 Peanut butter and chocolate could be the best combination in the dessert world. The whole salty/sweet thing is out of control - give me a salty pretzel dipped in chocolate any day. I was going to call this creation "granola bars" but it doesn't really fit because they're more like a cookie bar. So I went with "snack bar" because I am so creative... not. The best part about these snack bars - they are made with wheat flour, whole oats, antioxidant-rich unsweetened cocoa powder and milled flax seed. Tons of good fat and grains, but the only thing you taste is creamy peanut butter and chocolate. Win/win. Start by beating butter and sugar in a mixing bowl until creamy. I used 3 tablespoons of butter, which is not much at all. If you want to cut it back even further, use 2 tablespoons of butter and a tablespoon of unsweetened plain applesauce. Beat in one egg, vanilla, peanut butter and cocoa powder. Just give me this bowl and a spoon. Raise your hand if you think the baking process should stop here?! 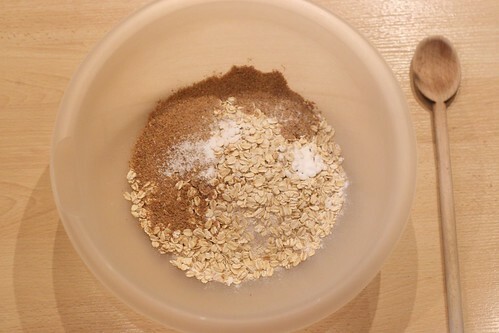 In another bowl, combine flour, wheat flour, oats, flax seed, baking soda and salt. You could also add wheat germ or any other kind of healthy crap that makes you feel good. Combine the wet and dry ingredients together. The dough will be very stiff so just keep working at it until all the flour mixture is moistened. Then add chocolate chips! 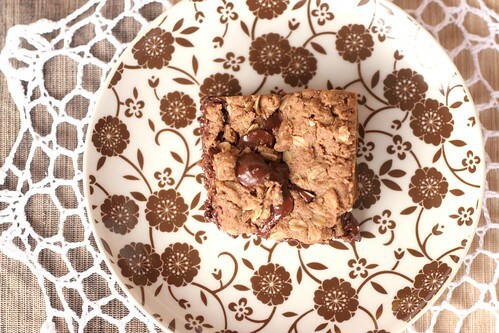 I used 70% chocolate because I love dark chocolate and it's better for you, which is awesome. I wish heavy whipping cream had antioxidants in it. It comes out of the oven looking totally irresistible. They are wonderful warm and gooey out of the oven. Loaded with good stuff too, so you don't have to feel bad about eating them. Preheat oven to 350 degrees. In a large mixing bowl, beat butter and sugars on medium speed until creamy, 4-5 minutes. 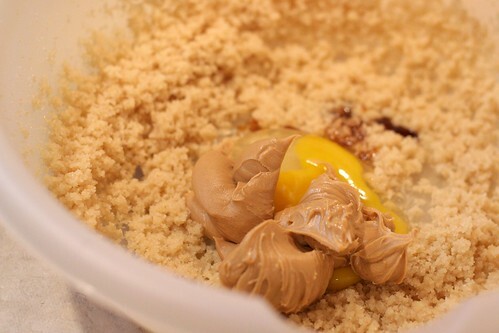 Add egg, vanilla and peanut butter. Beat until combined. Add cocoa powder and beat on low speed to prevent cocoa powder flying in your face! 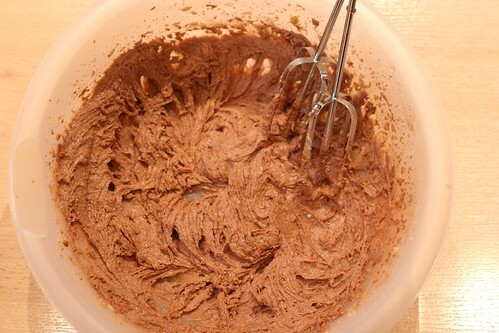 In a separate bowl, combined flour, wheat flour, flax seed, oats, baking soda and salt. Mix together. Combine dry ingredients into wet ingredients and stir until moistened. You may need to use your hands to get it all combined. Add chocolate chips and combine. 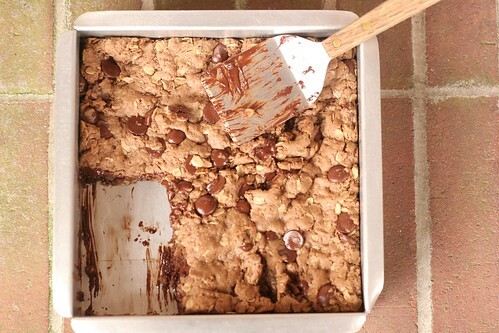 Pour mixture into a greased 8 inch square baking dish. Bake for 18-20 minutes or until gooey and delicious. Serve immediately, or cut into bars and store in the pantry. i love chocolate + pb combo!!!! this looks so amazing! Can't wait to try this. A perfect treat for my chocolate-and-peanut-butter-loving toddler. Healthy but he won't even know it! Those look SO yummy! I just got a huge craving for peanut butter and chocolate after reading this! Peanut butter and chocolate are my anti-drugs. I mean, really, why do crack when you can eat these bars? Right? Amazingly delicious! I wouldn't mind a snack bar right about now! What temperature did you set your oven to? Thank you everyone!! They are really good. I loved them the next day, warmed up for about 10 seconds in the microwave. YUM! I love this. And what better excuse to eat choc and peanut than it being healthy! love ur pictures and glad to have found you! These could make me turn into a desperate chocolatoholic :))! Your bars look so yummy!!! Oh, and congrats on top 9!! MMMM...looks delish! Good use for my oats! mmmm totally just added this to my "to bake" list! delicious! Oh, JENNA! Your instructions made me LOL ("You could also add wheat germ or any other kind of healthy crap that makes you feel good.") You sound a lot like me (xcept that I'm a CONFIRMED SKIPPY gal!) I'm thinking that the list of ingredients looks a bit LONG...so, I might just slather a bit of SKIPPY onto a chocolate KISS and be done with it!! (Until I'm feeling a bit more energetic, that is.) Thanks for posting this -- it really DOES look irresistible. Kathy, your comment made me laugh!! I hear ya - give me a spoon and a jar of peanut butter any day. Skip all that work and get straight to the serious stuff. Congrats on making Top 9 again!! This looks so yummy and I love that you used the all natural jif. Looks like a great product! do we need to use both flour and whole wheat flour? can i just use 3/4 cup wheat flour? sorry im not a regular baker! 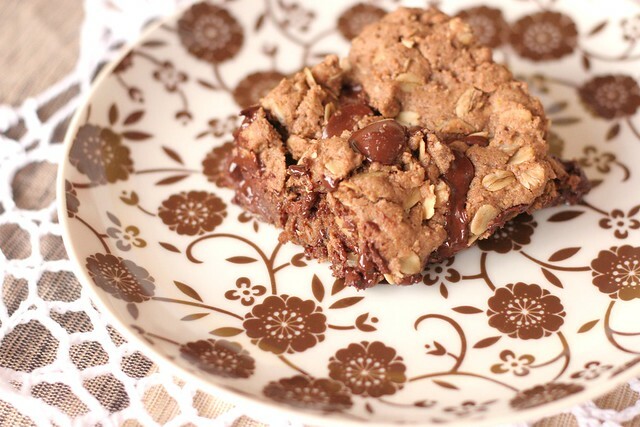 I love that you add oats and whole wheat flour to this recipe, such a unique way to take a cookie bar recipe to a whole new level. Thanks for sharing it! 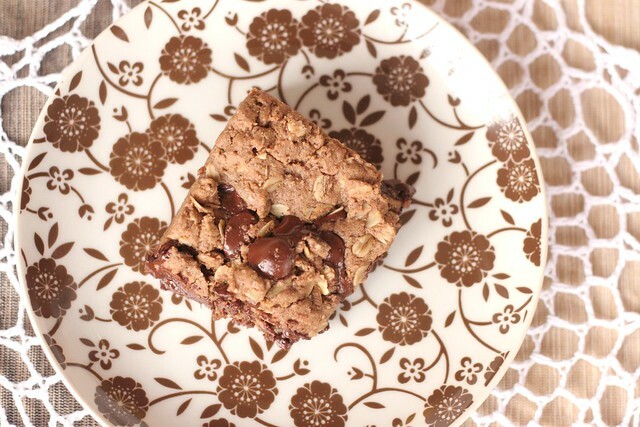 I love this recipe and am baking it tomorrow! what do you use to "grease" the pan? and do you recommend glass or metal? thank you Jenna! great recipes! To answer your questions: I don't always love the flavor of 100% wheat flour in baking, but that's just me. I usually go for 50/50 flour to wheat flour, but I used a little less white flour in this recipe. I think it turned out well, the wheat flavor isn't too overwhelming. But it would totally work using 3/4 cup wheat flour! The flax seed is also optional, I had it in my pantry so it was a great way to use it. This recipe is versatile - I would love to hear how some of you altered it! I usually use glass baking dishes, I have this weird theory that a metallic taste comes through when I bake in metal pans. It's probably not true. But I searched my whole house looking for an 8-inch glass baking dish, only to find a metal one. So that's what I used and it was fine! Whenever I grease a pan for baking, I usually soften a tablespoon or so of butter to smother in the pan. In this case, I was trying to cut down the calories so I sprayed the pan with Baker's Joy, a butter/flour spray for baking. holy delicious-ness! thank you JENNA! a healthy alternative to coldstone creamery where i usually get the peanut butter cup perfection. now i have found true perfection with health and goodness and taste through your recipe! Keri, you are so cute. That just brightened my day! Comparing this to Coldstone's peanut butter cup perfection is the best compliment I could get ;) Thanks for trying it!! Make sure to try a piece tomorrow, warmed up in the microwave for 10 seconds, so the chocolate chips get all gooey again... out. of. control. These are great!!! I wrote down this recipe, then could not for the life of me find this page again no matter what I typed in. It wasn't till I typed "healthy" that I finally found it! Anyway, I really enjoyed these cookie bars and might try them in the form of a cookie next time around. So chewy & rich. We ate it as a dessert last night, warmed up with a bit of ice cream, chocolate syrup & toasted pecans! Heavenly.....and, I know, not quite as healthy. I like the look of some of your other recipes as well, and plan on trying something new again soon. "You could also add wheat germ or any other kind of healthy crap that makes you feel good." Hello!!! I'm writing from Panama! I made these with whole wheat flour and brown sugar only. Just awesome. I posted a link to your blog on my FB profile with pics of my version of your recipe. They came out beyond yummy! Thanks and regards from Panama! Also writing from Central America (Guatemala). I've saved this recipe since it was posted to the top 9, and FINALLY got around to baking it. It was worth the wait!!! So delicious. I doubled the amount of cocoa powder. Next time I think I will bake it for only 15 minutes so that it is a bit more gooey. Thanks for the great recipe! Awesome recipe :D Thanks for sharing. I'm asian, but I love western sweet foods like granola bars and snacks so much :D I will give this recipe a try to day.